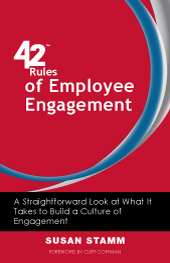 42 Rules of Employee Engagement (2nd Edition) takes a practical, straightforward and fun look at what it takes to build community, commitment and a culture of engagement in the business world today. The book highlights common behaviors that lead to “disengagement” in teams and offers useful, non-nonsense ideas for doing things differently. Susan Stamm will inspire and challenge you to create a unique workspace with your team that attracts and inspires high performance, commitment and authentic work relationships. This book is loaded with practical advice and actions you can take away to begin building an engaged team. Susan Stamm claims she has been a student of human behavior ever since her high school psychology course. Fascinated with how people transfer learning into consistent performance on the job occupies much of her thinking, reading and drives her passion for the work that she does at The TEAM Approach� (www.teamapproach.com). 42Rules of Employee Engagement (2nd Edition) was born out of need for dcorporations, leaders and managers to engage with employees. Depending on whose research you read, as much as three quarters of the global workforce were not engaged! How long could organizations continue down this path and thrive or survive? As overwhelming as these data seem, Susan Stamm began to recognize the solutions are simple and within our reach. Engagement begins and ends with leaders and their day to day actions. It's the little things that make the big difference: how much information the leaders shares, how they approach important conversations, how much control they need, and how well they listen. An organization can be a best place to work, yet have a team no one wants to work on. The reverse is also true and it is almost always related to the leader. A challenge is that leaders often have blind spots, especially leaders that are struggling with their teams. This book include stories that leaders can relate to and that might open the door for them to consider how their actions appear to others. The best way to use this book is as a conversation starter. Take it to lunch with colleagues and discuss a single rule and the implications for your teams. These rules are actionable; when there is a challenge, there is always a specific action or direction recommended for dealing with it. In addition to the actions offered at the end of each rule, Appendix C provides links to more than two full years of free employee engagement activities and tools. If you want better engagement at your company, you should pick up '42Rules of Employee Engagement (2nd Edition)' today. Want a branded edition of 42 Rules of Employee Engagement (2nd Edition) for your company? I once worked with a healthcare team that was in crises. As the group went around the table and shared concerns, it was obvious that the nurses did not perceive the physician as a caring person. One specific thing they challenged him with was that he never smiled at them or acted friendly. This physician operated from the �C dimension of behavior� (see Rule 18) and was quite reserved and task oriented in his approach. He seemed surprised by this feedback, however, and sincerely apologized to his team on the spot. Then he did an amazing thing: he made an immediate effort in the meeting to increase his affirming responses. As his team spoke, he smiled and appreciated their comments. To be honest, his smiles seemed forced and difficult for him, but his team rallied around him because he asked for their support and invited them to give him feedback any time in the future he was slipping up.